Here in the Piedmont region of North Carolina, summer temperatures have been keeping me sweating in the garden for about a month now. Because I had the best spring garden I’ve had in years, I rapidly fell behind on preparing the summer vegetable beds, which is why my squash plants are only just now ready to yield their first fruits. However, we’re still pulling onions, carrots, and even a little spinach from the spring garden, so I’m not too upset about the slower start to the summer vegetables. As fast as the summer vegetables grow, you can barely tell I got behind at this point. The tomatoes are all now taller than me (I’m 5’4″), and I’m going to need a step stool to stand on to harvest the ‘maters, since they’re clearly heading straight for the moon this year. But tomato talk is for another day. Today, I want to write about squash. This veggie is divided into two broad categories: summer squash and winter squash. 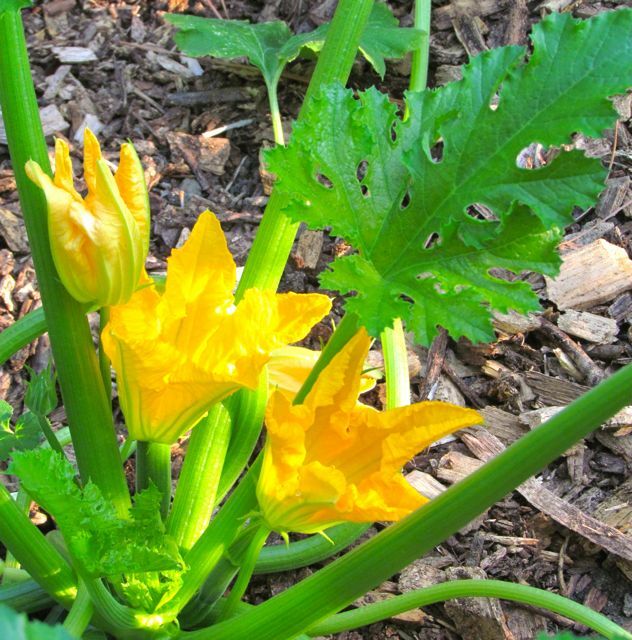 Summer squashes include zucchinis, crooknecks, and pattypans. You pick them when they reach a size you like, and you eat them right away. They’ll keep in the refrigerator for a week or two, but not much longer. Winter squash include acorn, butternut, delicata, and hubbard types, among others. These squash take longer to mature, and when stored in a cool, dark place (not the refrigerator) after proper curing, will keep for months. In my Piedmont NC garden, I have great success with the summer squashes — at least for a while — long enough for us to grow tired of eating squash every day. However, I’ve never had much success with winter squashes, mostly because I don’t seem to be able to keep them alive long enough to mature. It’s the bugs. Squash varmints are tough. The two insects that eventually kill my squash every year are Squash Vine Borers and Squash Bugs. All the gory details you need to know are here, but I’ll give you a few highlights. I usually see the Squash Bugs first. In fact, this year, I caught one loitering on a basil plant waiting for me to uncover my young squashes, which were sealed away safely under a spun lightweight garden fabric designed to thwart the bugs. This fabric lets in light and water, but the bugs can’t get through it. 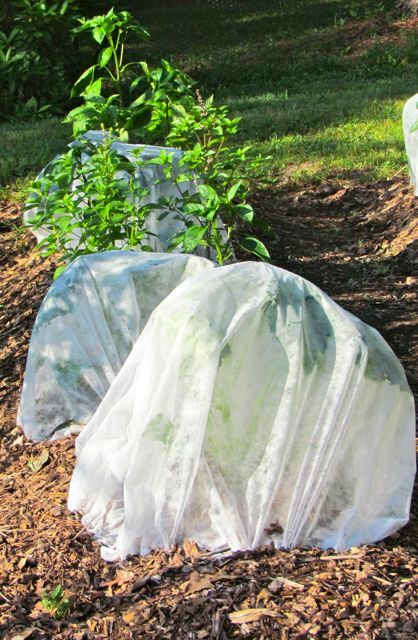 When I transplant my squash seedlings into the vegetable beds, I immediately cover them with this garden cloth. They stay under it until they begin blooming. Note that I didn’t plant them all together. In between them are peppers, basils, marigolds, and even some bush beans. By increasing diversity, I make it harder for the squash bugs and borers to find their targets, and I think the strong smell of the basils and marigolds may help disguise the squash scent a bit too — that’s my hope anyway. I stopped direct-sowing squash in favor of greenhouse sowing some years ago. I have better control. Seed packets tell you to sow squash in hills containing several seeds. I’ve found this just creates a big mess as the plants grow and become entangled, and it’s much easier for the bad bugs to hide from you. Now I plant individual plants, mulch them, and keep them covered until they begin blooming. We are all happier with this arrangement — not counting the squash predators, of course. This year, I’m growing three summer squash varieties and one winter squash. I am weak when I peruse the seed catalogs in January, and the description of Honey Bear — an acorn type — sounded too good to pass up. That’s it with its first bloom in the photo at the top of this entry. I grow two plants of each type — that’s eight squash plants, for those doing the math. I know — that’s a lot of squash. But when we’ve got more than we can handle, I generally give my excess away to friends and the local food bank. All the fruits find appreciative stomachs somewhere. Summer varieties this year are Raven zucchini — a deep green fruit producer we really liked last year, Plato zucchini — a new variety that produces over a longer period than Raven, which tends to produce all its fruits at once, and Summer Sunburst — a pattypan type with lovely flavor and color that we’ve enjoyed for years. As for the bugs, I don’t use poisons. You’ll just kill the pollinators trying to get to your squash blossoms if you use them anyway. Instead, I patrol my plants almost every morning before the sun gets too hot. 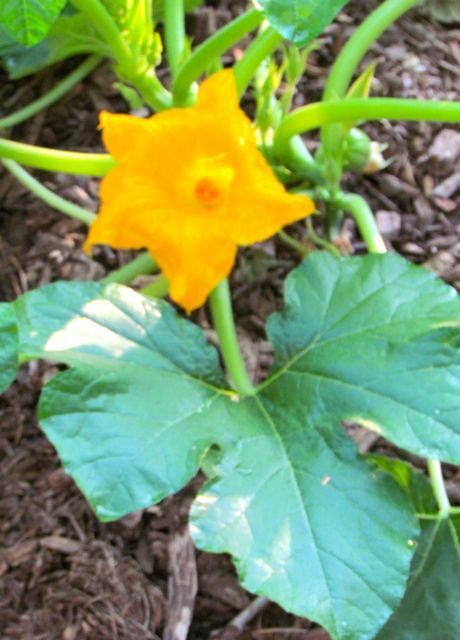 If you water the base of the plants, any hiding Squash Bugs will hightail it out of the mulch and onto the stems and leaves, where you can grab them and dispose of them. I keep a jar full of soapy water handy for the disposal part. I also inspect the leaves for the metallic bronze eggs of the Squash Bug; they’re quite distinctive. If I am diligent, I can usually keep my squash plants free of serious Squash Bug damage for at least six weeks after they begin producing. Squash Vine Borers are tougher. Borers are the larval form of a clear-winged, inconspicuous moth that lays its eggs on the stems. The eggs hatch, and the larvae burrow inside and start eating. Goopy sawdust-looking yucky stuff along the stems is usually the first sign that the borers have moved in. Your options from there are all difficult, and after trying every one of them, I’ve settled on burying the affected part of the stem in hopes that the stem will grow new roots and keep going. Sometimes this works, sometimes not. But I’m usually pretty tired of eating squash by the time the borers kill the plants anyway. At the same time borers begin to impact the squash plants, I’m usually dealing with unrelenting drought. Often my garden well has gone dry by then, and when squash plants don’t get enough water, the bugs cannot be stopped. It’s all downhill from there. Some folks have issues with powdery mildew on their squash. I suspect I rarely see this because of the way I space out my squash plants and interplant them with other veggies, herbs, and flowers, but that’s just a theory. All vegetables need an inch of water a week. If it doesn’t rain, you must add the water. This is especially important for members of the squash family (includes pumpkins and cucumbers), because so much of their fruits consists of water. Without adequate water, fruits will develop slowly, strangely, or not at all. 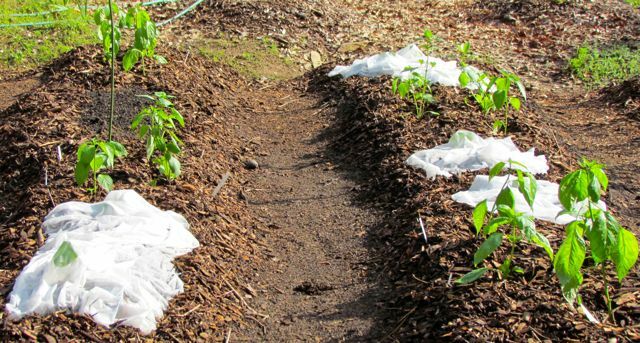 When I slip my finger beneath the mulch around my squashes and I feel only dry soil, I know they are overdue for water. I try to keep the dirt beneath the mulch around my squash plants moist at all times. Now you know everything I know about growing squash in the Southeast Piedmont of the United States. So get out there and get growing! This entry was posted on June 9, 2011, 3:45 pm and is filed under piedmont gardening, Vegetable Gardening. You can follow any responses to this entry through RSS 2.0. You can leave a response, or trackback from your own site.